This is a pair of Inversion Buggy 4WD Front Tires. Pro-Line is proud to unleash the Inversion tire into this years winter indoor racing scene! The Inversion is essentially an inverted Positron tread design that has been developed for tracks where ghost pins or almost slicks are ideal. The Inversion features directional grooves much deeper than the Prime tires combined with a rough textured tread surface for amazing grip even in dusty conditions. New to the 4WD Front Inversion tire is flatter tire profile for an improved contact patch over previous tires. Pair the Fronts with the Inversion Rear tires for the ultimate in track performance! Never grind new tires into ghost pins or slicks again. 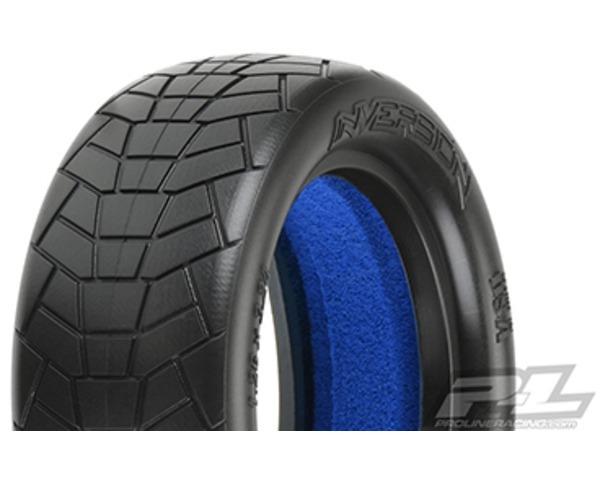 Get a set of Inversion tires today!